In addition to the demo video(s) I have also been working on a marketing ArtByte. This is often the most popular part of my workshops, so I thought it made sense to finally put it online. 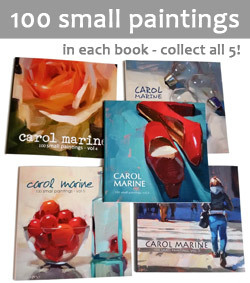 It costs $10 and you can find it in the Daily Paintworks ArtByte Store. 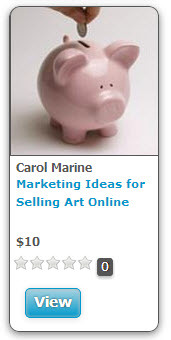 It is called "Marketing Ideas for Selling Art Online". Also, I have been working on a series of paintings, each focusing on one color. 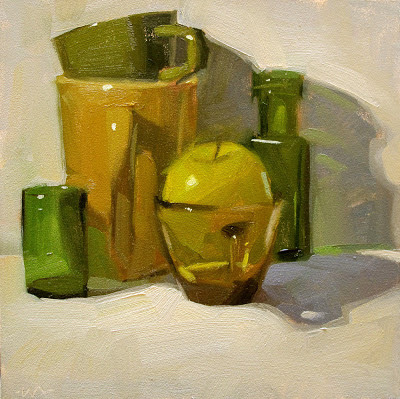 I did this before years ago with my old collection of still life stuff -- I thought I'd try it again now, and green is my favorite color. Fabulous. I've had the same idea....now I don't need to do it, 'cause you have.....and so well. Thanks Carol. Brilliant! I looked at it and it's the Wow! Well done, I love how you obtain glass transparency. What a wonderful variety of greens! It's my favorite color. It's also good for the eyes. I love the way you got the different shades and the translucency in the glass! I just watched your latest art byte and really enjoyed it. I was very surprised and pleased that you used my blog for one of your examples. Thank you. Green is my favorite color, too. So much green glass to choose from! You have represented green so well. Love it! the shadows and brush work you do is so fun and lively. I love green too!!! This is a gorgeous piece!! !